I recently had the privilege of attending the third Tantidhatri Festival, a Magdalena festival held in different locations in India since 2012. This time, from 15 to 20 January 2019, Tantidhatri was held at Rabindra Tirtha – an arts centre dedicated to the poet and philosopher Ranbindranath Tagore. The centre is in the middle of New Town, a 20-year-old building site of large through-roads and souless concrete buildings on the outskirts of Kolkatta. 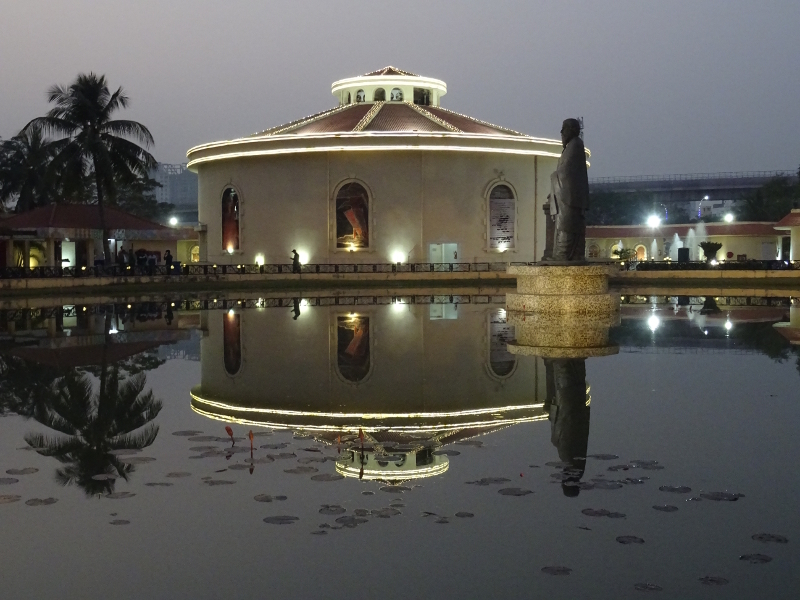 Rabindra Tirtha stands out from its surrounds as a peaceful oasis of art and contemplation, its circular main auditorium beautifully reflected in a large pond in the middle of a cluster of kidney-shaped smaller buildings. Behind the auditorium looms the massive, futuristic Biswa Bangla Gate, which when lit up at night looks like it’s waiting for a space-ship to dock; and a short distance along the fairy-light bedecked highway lies the extraordinary Eco Village, with its lake and boardwalks, mini Eifel Tower and colourfully lit palm trees in defiance of the all-pervading smog of the great city of Kolkatta. Typical India, placing great beauty alongside extreme ugliness. 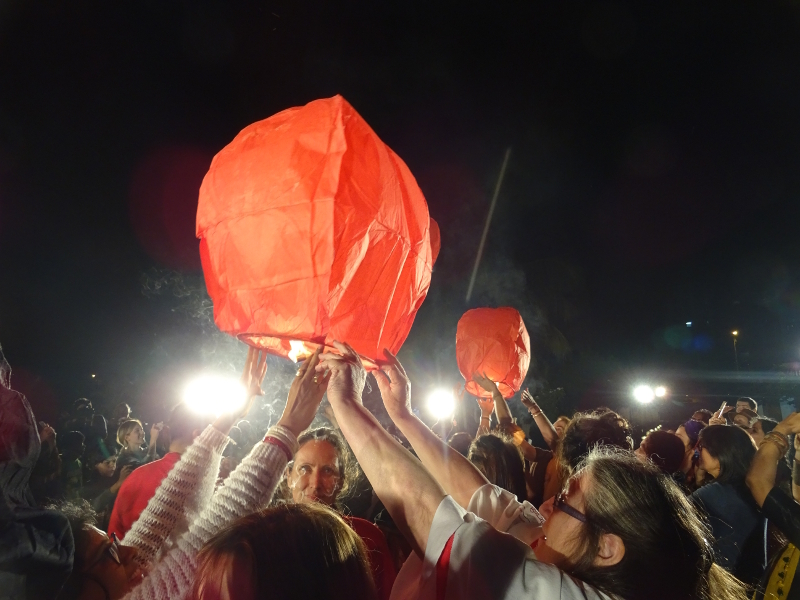 Launching fire lanterns at the festival opening. The theme of this edition of Tantidhatri was “Energy”, and this was expressed in many different ways through the programme. On opening night in her performance, Indian artist Seema Kholi said “Death is not an ending – it’s an energy changing direction” and I carried the consciousness of energies changing direction inside me throughout the festival. We are in the midst of a huge time of change globally, and where we choose to place our individual energies has an impact on shifts beyond ourselves. In which direction to we want the energy to shift? My own contributions to the programme were speaking on the panel “Energy Gathering” about feminist networks, and a talk about the energy of cyberformance – both the intangible energetic impulses of connection across distance and the physical energy consumption of the internet and digital technologies. The festival was as intense and wonderful as I had expected. We were kept on our toes with daily changes to the packed programme, which frequently went from lunch until late evening without a pause. One of the volunteers beating a large gong herded us from one event to the next. We slipped out shoes on and off many times and willing drank sweet tea in lieu of coffee. One of the highlights of the performance programme for me was Sima Gosh, a singer-storyteller in Pandavani tradition. I had no expectations of this performance, no previous knowledge of Pandavani, but from the moment Sima stepped onto the stage it was clear that we were in the presence of a master of this form. I now know it to be a popular folk style of oral storytelling, featuring tales from the Mahabharata. Sima Gosh was accompanied by five musicians, who sometimes made interjections or comments in response to the story, as I imagine the public might do in a normal setting. Sima was powerful and mesmerising – even though I didn’t understand the language at all, I was captivated and found myself transported through her intonation, pace and energy. Later on the same day came another highlight: Kim Hye Mee and Kim Yoo Na from Korea presented “Voice of Women echoed in Korean Pansori.” Like Pandavani, Pansori is also a form of traditional storytelling, but completely different from Pandavani. Kim Hye Mee’s powerful deep voice combined with Kim Yoo Na’s eerie and at times punk bowing and plucking of the ajaeng. There were many other powerful performances – Maristella Martella’s tarantella performance “Cassandra”; different Odissi dance performances from Ileana Citiaristi and Parvathy Dutta; and Rakini Devi and Violeta Luna’s “Two Madonnas”, blending Mexican and Indian iconogray – to name but a few. There were also several English-language premieres, from DAH Theater (Serbia), Amaranta Ossorio (Mexico/France), Verónica Moraga (Chile) and Viviana Bovino (Italy/Spain). As someone struggling with a second language in performance (see Unaussprechbarlich), I have great respect for those who perform their work in one or even more languages other than their mother tongue! 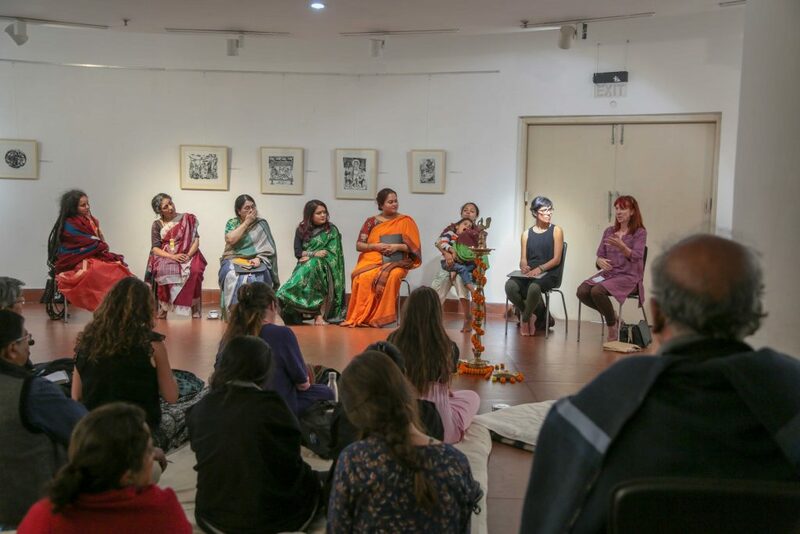 As with previous Tantidhatri festivals there were several interesting forums that brought together Indian women artists and activists with the visiting international artists. We heard about projects using dance with prisoners, opportunities for railway platform children (who are born and live on the platforms), the experiences of Indian transgender women, and from young Indian women who are speaking out about sexual violence and other taboo topics. In a country where arranged marriage is still widely accepted and honour killings do still happen, women who express feminist opinions through their work and art are very brave indeed. 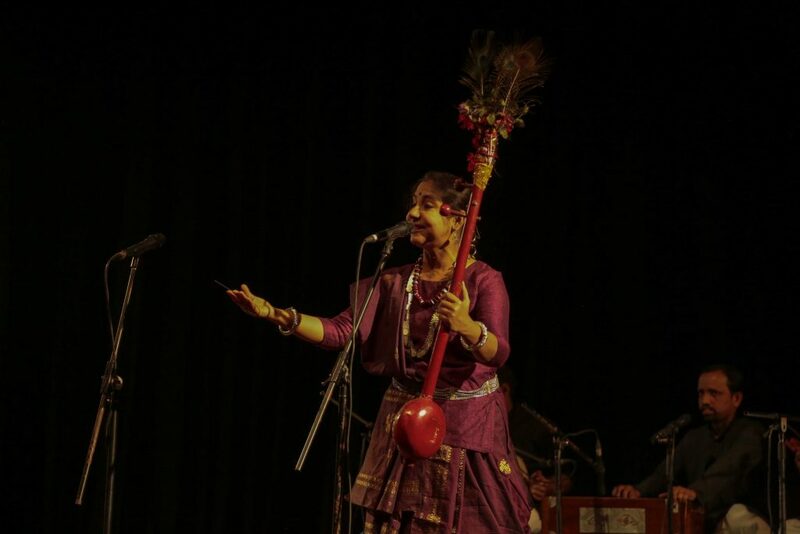 A feature of the festival was the daily “Bauls of the coming generations” concert, with performances by some of festival director Parvathy Baul’s students, who were also volunteers at the festival. This gave us the opportunity to get to know them better, through their music and not only as volunteers; and they had the chance to perform to an international audience. The selfless dedication of the students, not only to their craft but also to their guru Parvathy-Ma, and the performance of all work and art as an act of devotion, is not something that we find often in western culture. It’s curiously liberating to experience – pure giving, without pretension. As well as my talk, I helped Amaranta Osorio with her work-in-progress “What I did not say”. She developed this piece last year at the Magdalena festival Mestiza Chile, in collaboration with Suzon Fuks, and it involves projected images and texts. Trickily, the projector needs to be moved to different positions during the performance, and as Suzon wasn’t able to come to the festival I offered to do this technical role. The scheduled time for the performance was changed when Amaranta lost her voice at the start of the festival, and as she was also one of the organisers and there were very few gaps in the programme, our rehearsal time became quite short. However we managed to rehearse it enough for me to know what to do, and we were helped by Baju, a very nice technician. The performance went well and was met with an enthusiastic response from the audience. Magdalena festivals usually include an exhibition in the programme, and Tantidhatri was no different. One wall of the gallery was hung with a selection of photos from the previous Tantidhatri festivals, and on the long gently curving outer wall was an exhibitions of woodcuts. These were illustrations by Parvathy Baul which her husband, Ravi, had made into woodcuts. The topics included the daily life of Baul singers, spiritual mediations and scenes from the legends. One that really struck me was quite different to the others. Slightly surreal, it depicted a dishevelled old man sitting in the middle of a busy road, drinking whisky and burning books. Parvathy explained that this was one of her gurus, Thangal, who had become so spiritual that he renounced all rules and did as he pleased, and had the power to appear in different places at the same time. He was Muslim, so should not drink, but gave up eating and drank only alcohol. He burnt all his books as he believed words were not important. Unfortunately this alienated him from the Islamic community and they stoned him (this happened in 2007), leaving him very badly injured and he died a short time later. The picture strikingly conveys his rebellious spirit, with flaming books flying off out of the frame and the guru in the centre like one of the many cows or dogs who sit calmly amidst the chaos of Indian traffic. After the festival many of us travelled together to Santiniketan. The train journey was an adventure in itself – starting with Howrah train station itself, the largest railway complex in India serving an estimated 2 million passengers a day. An island of 20 or so white people accompanied by colourful wheelie suitcases, we were engulfed in rivers of Indian people as each bulging train arrived and departed. During the journey we were entertained by the parade of vendors coming through the carriages selling everything from snacks and hot chai to pens, wallets, socks and cheese graters – everything you might have a need for on the journey! Arriving at Santiniketan, the small rural town where Rabindranath Tagore established a university in 1901, we were corralled by the tireless volunteers and despatched in a convoy of 4-seater tuk-tuks for the journey to Sonajhuri Athiti Ribas, the eco guest house where we were to stay. This proved to be a beautiful location just outside of the main town, run by a welcoming and helpful host and serving excellent food. Here we were also given Ayurvedic treatments – oil massage and body steaming. We were able to relax, sleep, wander to the nearby markets, sit and eat and talk together, breathe fresh air and generally unwind after the intensity of the festival (and, in my case, develop the cold that everyone had been sharing during the festival). We visited Sanatan Siddhashram, where Parvathy and her students are living. They started building the ashram in mid-2017 and have already achieved a lot. The buildings so far include a beautiful circular space for talks, teaching and meditation; a smaller circular space where we ate; and toilets, a kitchen building and sleeping huts. There are vegetable gardens and rice paddies. Constuction is well under way on a building that will be Parvathy’s house. For the future, guest accommodation and classrooms are planned, and a centre for Ayurvedic learning. Everything is being developed on organic principles and solar energy generation is planned. The first night when our convoy of tuk-tuks returned us from the ashram to the guest house, it was very cold and damp as we drove past rice fields, small villages and large open fields. I was sharing a tuk-tuk with Viviana, Gregorio and their baby daughter Alma, as well as Veronica. As the cold intensified, we wrapped the sleeping Alma in all our spare clothes, then tried to pull down the plastic curtains of the tuk-tuk. The driver stopped and helped us, creating a little tent inside which we huddled together. I felt as if we had travelled back 200 years to a Jane Austen or Bronte novel, traveling across the moors in a closed carriage. Behind us the lights of the following tuk-tuks were strung out along the road like lanterns or fireflies in the darkness. (I was reminded also of a journey on my first visit to India back in 1987, when we went sledding in the snow-covered hills of Kashmir. On the drive back to Srinagar, Louise and I sat in the back seat of the car holding baskets of hot coals under our blanket-coats to keep warm, and REM was playing on the car stereo; another dream-like Indian experience!). All good things must end, and each day a few more artists departed from our idyllic retreat. Finally it was the turn of Jill, Meg and I to be driven back to Kolkatta. Another adventure – the driver didn’t know where our hotel was, and took us to completely the wrong place. As we began to recognise the ugly neighbourhood of New Town, we began to feel as though trapped in a bad dream of misunderstandings. Eventually our driver transferred us to another taxi driver who was more familiar with Kolkatta, and soon we entered the crowded streets of the old city. When we finally arrived at the lovely Bhodi Tree Hotel, festival volunteers Vinayaki and Babu were waiting for us and took us a short distance away to … the golf club! As if in a parallel world, we sat sipping beer at the edge of a luxuriant golf green, our view only grass and trees, with a massive colonial style ladies bathroom complete with sofas, hot running water and toilet paper, while a mere hundred metres away on the other side of a wall existed the teeming life of Kolkatta. I only had 24 hours before my plane home, and the nasty cough I’d developed after the festival was getting worse, so I left our tourism planning up to Jill and Meg – and Viyanaki, who organised cars and drivers and an evening cruise on the Ganges for us. In daylight, the Ganges at Kolkatta is quite depressing. There was not much difference in the dirty grey colour of both sky and water. Rubbish (organic and non-organic) floated alongside the boat, and the air was acrid. However our guide told us about the gangetic dolphins that inhabit the soupy water, and sharp-eyed Meg spotted several. As the sun was setting we disembarked at a temple complex, where we were greeted by a cacophany of birds preparing to settle down for the evening. The huge main temple was packed as evening prayers were taking place. We were able to follow a live stream on a large outdoor screen, capitvated by the mesmerising chanting and a priest’s delicate and concentrated choreography of actions around the statue of a guru. Sailing back up the Ganges in the dark was much nicer as many buildings and statues along the river bank were colourfully lit up, and signs of squalor disappeared into the night. Unfortunately I had a huge coughing fit as our dinner was served, which wasn’t very pleasant for me or our fellow tourists. The next morning we went to Kalighat, a renowned temple to the goddess Kali. We were shown around by friendly priests who, unsurprisingly, contrived to relieve us of some money. A long queue snaked out of the temple containing the main statue of Kali, but we were taken around the back and able to look in from another side. There were crowds of people everywhere, pressing to see the statue or busy preparing sacrifices (yes, we saw an unfortunate small goat being carried to the sacrificial temple) or other religious practices. We were blessed, instructed to make wishes for our families, red and yellow threads tied around our wrists, flower garlands placed, money exchanged. Everything felt a little rushed, but there we were – tourists, without any of the wonderful volunteers to guide our experience, so we got the tourist experience. After that a bit of retail therapy was required, and before long I was on my way to the airport, armed with a variety of Ayurvedic and herbal cough syrups. My journey home was uneventful but arriving to minus 1 degree and snow didn’t help my cough. I didn’t leave the apartment for the first week, apart from going to the doctor. It was frustrating to be sick as I didn’t have the energy to digest and write about my experiences, or to prepare for my next things here, or even to properly unpack! However I’m now well enough to finish this blog post, and I am energised by the richness of Tantidhatri. Thank you to Parvathy, Amaranta and all of the volunteers who made it happen!